The U442-DOCK1 USB 3.1 Gen 1 USB-C Docking Station turns your computer, laptop or tablet into a versatile workstation. By connecting its built-in cable to your device's USB-C or Thunderbolt 3 port, you'll be able to add an external display, access Gigabit Ethernet networks, transfer data, display video and more.Mini DisplayPort, VGA and HDMI ports allow you to connect an external display (one display at a time). With the addition of adapters (sold separately), you can also add a DVI or DisplayPort display to the U442-DOCK1. The Mini DisplayPort and HDMI ports support UHD video resolutions up to 3840 x 2160 (4K x 2K) at 30 Hz. The VGA port supports HD video resolutions up to 1920 x 1200, including 1080p, at 60 Hz.Connect a Gigabit Ethernet cable (sold separately) to the RJ45 port to access true 10/100/1000 Mpbs network speeds. Three USB-A hub ports are convenient for connecting peripherals to your device. Each supports data transfer rates up to 5 Gbps. A dedicated BC 1.2-compliant USB port provides up to 1.5A of fast-charging power.The U442-DOCK1 also features a USB-C Power Delivery (PD) port that supports power input up to 20V 3A (60W). It connects to a USB-C wall charger to power the device it's plugged into, as well as peripherals plugged into the USB-A ports.Micro SD and SD/MMC memory card slots also provide access to external memory. A 3.5 mm audio jack is convenient for connecting speakers, headphones or a microphone to your connected device. Newer tablets, laptops, Chromebook™ and MacBook® notebooks, desktop computers and even smartphones often have USB Type-C™ ports, but come equipped with few others. 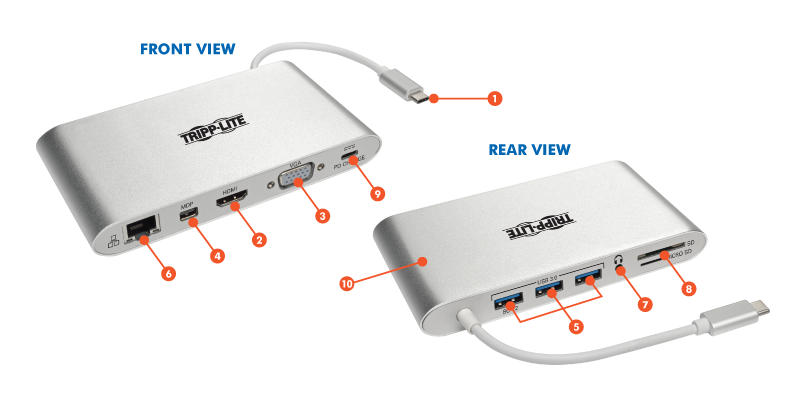 Using a single USB-C™ or Thunderbolt™ 3 port, this Tripp Lite docking station adds 11 connection options to your device. Send video to an HDMI, Mini DisplayPort (mDP) or VGA monitor. Access MicroSD, SD and MMC memory cards. Charge additional devices like smartphones. One USB-C connection provides 11 different ports, so you don’t need multiple adapters. This docking station is also bus-powered, so you don’t have to travel with a separate external power supply. When used as a permanent docking solution on your desk, it offers the convenience of having a single USB-C cable to unplug when you take your laptop on the road. With a footprint similar in size to popular smartphones, this portable docking station fits almost anywhere. This docking station supports USB DisplayPort Alternate Mode (Alt Mode) for transmitting video to a monitor, television or projector. The HDMI port and mDP support digital video resolutions up to 3840 x 2160 (4K x 2K) at 30 Hz. The VGA port supports video resolutions up to 1920 x 1200, including 1080p, at 60 Hz. The USB-A ports allow you to connect a huge variety of USB devices, including flash drives, cameras, keyboards, mice and external hard drives. You can also connect a printer with a USB cable when a wireless connection isn’t feasible. The ports support USB 3.1 Gen 1 data transfer rates up to 5 Gbps. They also support device charging and are backward compatible with previous USB generations. Limited USB-C ports can force you to choose between connecting a peripheral and charging your laptop’s battery. The USB-C Power Delivery (PD) port powers and charges your laptop without affecting the other connections. Your laptop’s wall charger connects to the USB-C PD port, which supports power input up to 20V, 3A (60W).